Few candies can claim to be as polarizing as candy corn. When the waxy, kernel-shaped sweets inevitably return to decorative bowls in homes and offices across America every fall, the debate over whether or not they're a garbage candy rages on once again. However, no matter where you stand on this important issue, it's safe to say almost everyone agrees that candy corn definitely does not belong on pizza. At least, that's what you might infer based on the online reaction to one man's peculiar culinary experiment and what appears to be some A+ trolling. On Sunday night, Twitter user @TheRealAsswolf shared before and after photos of a frozen pizza he modified with some, uh, rather unusual toppings. Since then, his post has been retweeted more than 12,000 times and has inspired a slew of emotional reactions -- the overwhelming majority of which seem to range somewhere between utter horror and absolute disgust. Even Pumpkin Spice Pizza couldn't bring out this kind of fury. Better hide before Gordon Ramsey sees this. What kind of hideous rash is that? As the comments raged, @TheRealAsswolf chimed in to let everyone know that he actually liked the monstrous candy pie, but even the folks at DiGiorno made it clear they do not approve. 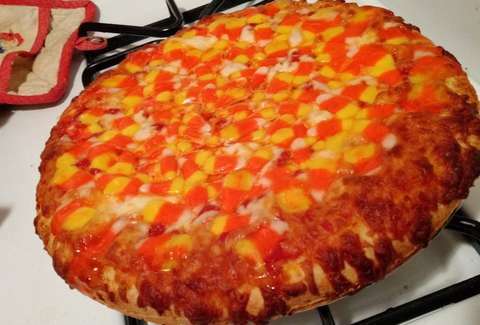 Twitter has spoken, and it has made candy corn pizza its sworn enemy. But the real question is, is it worse than pineapple pizza?